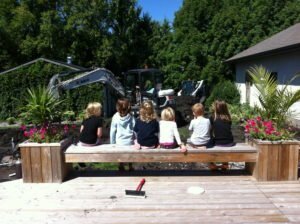 More often than not, the access to your backyard involves machinery travelling between your house and your neighbor. You might be lucky enough to have an open lot or back lane but most folks will be asking their neighbor to allow us to cross their property. In my 42 years of experience I must say Winnipeggers are almost always cooperative when it comes to this request. The typical requirement is 7’ for standard excavating machinery. With a common side yard of 4’ in new homes, that means 4’ of your property and 3’ of your neighbour’s. You should advise the neighbor you will need access for about 3 weeks and you will ensure their property will be restored to how it looks today. 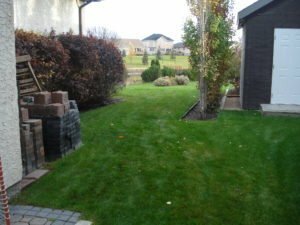 We offer landscape repair so you don’t have to find a different contractor to do the repair who may be delayed and test the neighbour’s patience. If the neighbor has pets we can install temporary fencing to minimize the hassle for them. If you don’t have 7’ then a smaller machine can be used which will require a minimum of 5’ However there will be additional cost as the time is doubled or tripled to complete the excavation. 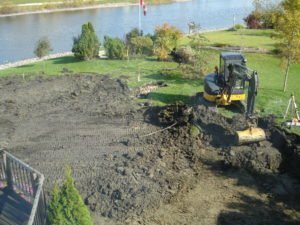 We have had jobs that only have 3’ of access and in this case we have used a crane to get the excavating equipment into the backyard and used wheelbarrows to remove the earth. This would be an added cost as well. Expect to add at least $10,000 if you only have 3’ of access. We often get asked if there is any risk of damage to a home when entering in tight access areas. There is some risk so be sure to deal with a reputable established firm that will be looking after any repairs if needed. However, I have never seen any large damages, just small repairs to stucco mostly. Even the small repairs are rare if you deal with careful excavators such as Aqua-tech. With over 40% of Winnipeg’s annual pool building permits, yet only 10% of the advertising, Aqua-Tech is proud to be Winnipeg’s #1 choice for pool installation based on customer satisfaction.